Italian builder Overmarine has announced the sale of two new high-performance superyachts – a Mangusta 165 and Mangusta 94 – to the American market. 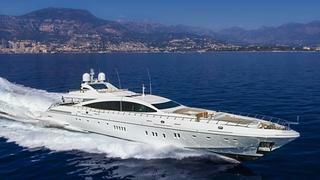 The first yacht sold is the current flagship, a Mangusta 165. This is hull No 10 of the largest yacht in the Mangusta lineup and the third to be sold in the past three years and nine delivered in seven years. Hull No 10 will stand out from her predecessors with new “evo” aesthetics, as the builder is calling them, which are have more aggressive, rugged and muscular exterior lines, new glazing on the main deck with a single pane of glass stretching across the saloon – serving to offer both excellent visibility from inside and let tons of light flood inside. This 50 metre flagship can reach top speeds up to 40 knots depending on the engines chosen. Hull No 10 will be powered by four next-generation 2,600hp MTU 16V 2000 M94 engines coupled to four Rolls Royce KameWa waterjets. The new engines are lighter and more efficient, and the waterjets are stronger, promising improved performance. The second reported sale is for a Mangusta 94, hull No 4 of the new model that builder recently introduced. The first Mangusta 94 was launched in 2013, and so far two have been delivered in Europe. The newest Mangusta open yacht is racy and sport, and boasts expansive outdoor areas with a bow cockpit and a spacious sun deck. Overmarine says its luxurious maxi open yachts – which run at fast speeds – are ideal for the North American market and specifically in Florida or the Hamptons in New York where the distance between the destinations is relatively short and quick to reach thanks to the fast cruising speeds. The boats’ shallow draughts and hydro-jet propulsion are an asset to clients enjoying these close-to-shore cruising grounds.